When you are purchasing new gardening tools, you will more than likely have a choice of low price/low quality or higher priced/high quality tools. Quality tools are designed to last many years, but they must be cared for and maintained. If you opt for bargain priced tools, maintaining them is less of a problem. When they wear out, you simply throw them away. Maintaining your garden tools on a regular basis assures that they will be ready to go to work on your next garden chore. Following a few basic rules will add many years of life and use to all of the tools which make your gardening tasks easier. Always remove all of the soil from your digging tools after each use. Usually hosing is all it takes, but use a screwdriver to remove dried mud. Never put your tools away wet. Allow them to dry completely before storing to prevent rusting and handle rot. After each use, wipe the metal parts of pruners, shears, and loppers with an oily rag. Thoroughly clean any tools which have been used for chemical applications. Fertilizers and other chemicals will rapidly corrode any metal parts. For extra rust prevention, fill a 5 gallon bucket with builders sand and pour a quart of new motor oil over it. Use this as a shovel cleaner/oiler each time you put your tools away. Push each tool into the oily sand several times. You can also use this bucket as a shovel stand. The Orange Star Plant is a long blooming (1-3 months), frost tender bulb type plant that is native to the mountains and flats of South Africa. It is mainly grown for cut flowers and as flowering house plants. 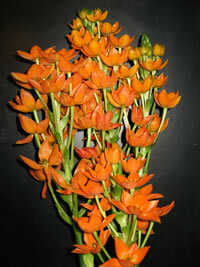 Orange Star Plants produce upright spires of beautiful, lightly fragrant, yellow to orange cup shaped flowers. Star of Bethlehem plants and other members of the Ornithogalum family can be grown from seeds sown in flats of moist mixture of peat moss and perlite in the spring. Cover the seeds lightly with peat moss, then seal the flat in a plastic bag and chill in the refrigerator for about three weeks. Keep the flat watered under flourescent grow lights or in a shady part of the garden until germination, which can take anywhere from from one to six months. When the young seedlings develop their true leaves you can transplant them to their final location where it will take four years before you see their first flowers. Star of Bethlehem can also be propagated by offset bulbs removed from the cluster and replanted in the spring through summer.